Ski goggles are an important piece of kit. They protect your eyes from the elements, such as snow, wind, and harmful UV rays, while improving your vision so that you get to see the mountain as well as possible. The functions and features that goggles can have are often overlooked, with a lot of people just buying the cheapest pair they can find. Yet the difference between a cheap pair of goggles and a good pair, can be vast, and can make a huge difference to how well they work, and how comfortable they are. Some people prefer to wear sunglasses while skiing, especially in warmer weather, but on those cold, windy, or snowy days, nothing will let you see better or protect your eyes better, than ski goggles. Ski goggles are made from several different components, which all have an important role to play in improving your vision, protecting your eyes, and keeping you comfortable. Below is a diagram of the different components, and explanations on what each of the components do, and what features they can have. The lens is very important, as the main purpose of goggles is to put a lens in front of your eyes. On most goggles the lens is actually made of 2 separate lenses put together. Between the two lenses is a foam divider creating an air gap between the layers. This insulates your face more and also stops the inside lens becoming as cold which makes the goggles more resistant to steaming up. Lenses are normally made from a polycarbonate or Trivex plastic, which makes them more impact resistant and less likely to shatter than glass or normal plastics. 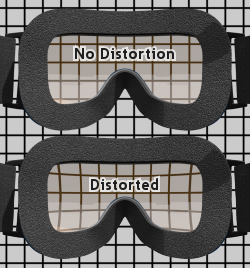 The are two different basic shapes that goggles lenses can have. Flat lenses are flat vertically with a curve sideways across the goggles. Flat lenses are the cheaper type of lens, and are good for people on a budget. Spherical lenses are curve in all directions, and are shaped as if they were cut from part of a sphere. Spherical lens are more expensive, but offer better peripheral vision, and have less optical distortion. Another solution to changing the lens in your goggles for different weather conditions, or using one lens that isn't always right for the conditions, is to have a photochromic lens. Photochromic lenses get lighter when there is less light, and darker when the light is stronger, so that the lens self adjusts depending on the weather conditions. Most photochromic lenses use a grey or brown tint though, so they can miss out on some of the advantages that other colours can give. Polarised lenses are very good at reducing glare from the snow as they block out light that is horizontally polarised. A lot of the light that bounces off of snow and ice is horizontally polarised, and therefore the glare from the snow is largely reduced. Polarised lenses are not ideal however, as they can make it harder to see icy patches in the snow, and at the end of the day when there are a lot of shadows around, the generally darker tint and polarisation in the lens can make it harder to see bumps in the snow. Many goggles have reflective coating on the outside of the lens that creates a mirrored effect. This type of lens is generally good for sunny weather as the reflective layer reduces glare from the snow. The colour of this mirror effect is not necessarily the colour of the lens tint though, as the coating applied on the outside of the lens works differently to the colour of the material that the lens is made from. Virtually all ski goggle lenses these days protect you 100% from UV light, making sure harmful UVA, UVB, and UVC rays cannot get to your eyes. This is how much the goggles restrict your vision, especially around the outside where the frame of the goggles is. With a good pair of goggles you will be able to see almost as much while wearing them as you can without them on. Having a good field of view will help a lot with your awareness and make you feel more comfortable on the slopes. Most of the more expensive goggles will have very little or no optical distortion, meaning that what you see through them is very close to true. Some cheaper goggles however can distort your view slightly, producing effects that make it look like there is a dip in the snow in front of you, or make objects towards the edges look odd. Rarely will these effects be so bad that they make the goggles uncomfortable to wear, but if you want to know what you are seeing is true, it is best to go for goggles that say they are optically correct. For people who wear glasses normally, some goggles can come with prescription lenses, or have optical clips put in them, so that you don't have to try and wear the goggles over your glasses. If this is out of your budget however, there are goggles which are designed to be worn comfortably over glasses. This is a coating on the inside of the goggle lens, that stops them from fogging up so easily. This does not mean that they will never fog up, it just means that they will be more resistant to it. You should try to avoid cleaning the inside of your goggles, as this will start to take the coating away. If you need to clean the inside of the goggles, it is best to dab them with a lint free cloth, and not to wipe them. The polycarbonate or Trivex plastic that lenses are made from is very good at absorbing impacts, but the properties that let them do this also mean that they are more easily scratched. Therefore most lenses have a scratch resistance coating added to them to make the lenses harder to scratch. 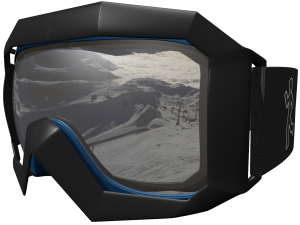 The frame is the housing that holds the goggles together, and is generally the part of the goggles that defines the look and style. However the frame is not just there for show and also has properties that can effect the goggles function. 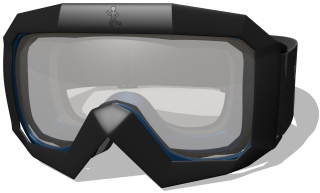 Most goggles will have holes in the frames covered with foam, so that air can flow through the goggles. The foam lets air flow through but keeps snow and anything else out, so that the inside of the goggles stay clean and dry. The reason for ventilation is to keep your face cool and to take water vapour out from within the goggles, this stops the goggles from steaming up so easily. However ventilation only really works while you are moving, and letting air flowing through. If you are hot and you stop moving, goggles can be prone to steaming up, as the water vapour is not being taken away fast enough any more. 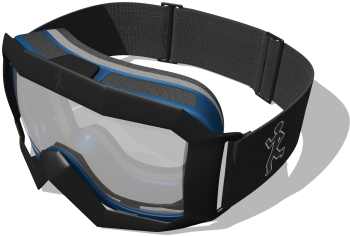 The shape and rigidity of the frame also does a lot to effect the fit of the goggles, meaning that not all goggles will fit everyone's face well. The purpose of a frame clip is to allow the area where the straps attach to move forward while still pushing the frame of the goggles back, so that the goggles have a more adaptable fit when used with helmets. 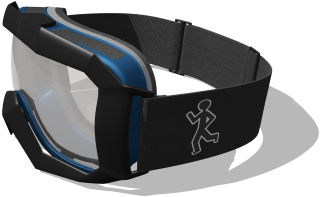 The frame clip does this by attaching to the straps at the side, but only attaching to the frame in the very centre of the goggles, meaning the whole width of the clip can bend and come forwards if it needs to. Not all goggles have this feature though, some goggles have small arms at the sides instead to allow for this movement, but a lot of goggles simply don't have anything for this. It is not a must have feature as most goggles still work well with helmets, but if you buy goggles without a frame clip or a similar feature, it is best to check that they fit your helmet well before buying them. The padding it the part of the goggle that sits against your face. 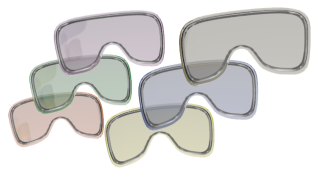 Most goggles with have 2 or more layers of foam in the padding, with different densities. This enables the padding to mold to your face better, so that the goggles are more comfortable. The thickness, width, softness and shape of the padding can vary a lot between different makes and models of goggle, so it is worth trying a few makes and models on to find out which is the most comfortable. 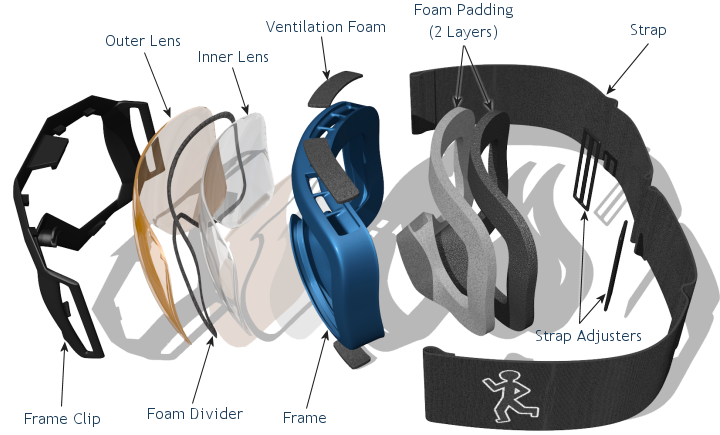 The strap is the band that goes around the back of your head or helmet, and holds your goggles on. Straps do not vary as much as other parts of goggles can, but they can still have different ways of adjusting their length, and some goggles have clips on the strap so that the loop of the strap can be opened if needed. Some straps also have rubbery areas on the inside to make them stay in place better when use on helmets. When you are not wearing the goggles it is always best to keep them in their ski goggle case, this will protect them and stop them from being scratched so easily. After a day's skiing it is good to leave your goggles hanging above a radiator or in a relatively warm area for a few hours, so that all the moisture on the goggles and in the foams and padding evaporates. 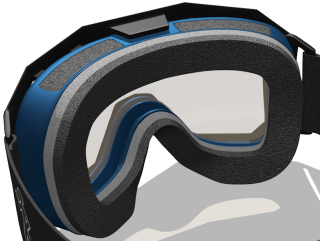 This will make the goggles more comfortable and more resistant to steaming up the next time you use them. Don't leave them anywhere too warm, just somewhere warm enough that the moisture can evaporate. When you clean the goggles always try to use a lint free cloth, and try not to touch the lens with your hands. If you need to clean the inside of the goggles, try not to wipe the lens, instead dab the lens with the cloth, this will make the anti-fog coating on the inside of the lens last longer. Try not to leave your goggles in direct sunlight, or in areas with excessive heat. Firstly try on goggles from several different manufacturers. The frames and padding on different makes of goggle will have different shapes, and you need to find which makes fit your face well. Once you have found the makes that fit your face well, you need to decide roughly what you want to spend on the goggles. Whether you are going to go for the top of the range, middle of the range, or goggles that are as cheap as you can get away with. Next you need to decide what kind of weather you will be using the goggles in most often, and gather the goggles together that have the right kind of lens tints for these conditions, while still matching the makes and price range already decided on. Lastly you need to try on all the goggles you are left with and see which suit you the best, which fit on your helmet the best, and which also meet any other preferences you might have such as spherical lenses, or better ventilation. From here you can make the final decision on which goggles to buy. On to the Helmets section.